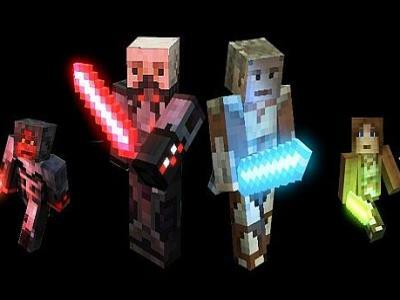 The Star Wars Texture Pack brings the Star Wars universe into your Minecraft games. The texture pack brings an entirely new feel to your Minecraft game, added new textures for your blocks, turning your simple swords into brilliant light sabers, converting the armor types to more fashionable Star Wars armor, and more! The games of survival you used to play will turn from a simple gathering of resources to an epic battle across your world. Block types: Before, the buildings you created in your worlds were simple stone and wood, enough for houses or estates, but anything more than that required the use of imagination. The Star Wars texture pack changes the color and pattern of the blocks that make up your world. This allows you to create anything from star ships hovering in orbit to a smugglers palace. Word Décor: Blocks are not the only thing to have received an art overhaul. The skies of all of your Minecraft worlds now contain two suns, similar to Tatooine. And the mobs that wander the world have had their skins edited. The zombies that used to charge you are now dressed dark jedis dressed in robes, while the arches have abandoned their bows for blaster rifles and changed into a stormtrooper’s armor. Equipment: A world of star ships and space travel would be no fun if all of your weapons stayed the same. Each type of sword (iron, stone, etc) now has a corresponding lightsaber. Your stone sword has been replaced by a green lightsaber, iron by a blue, and if you’re feeling like a villain, the gold sword has been edited to appear as a red lightsaber. For when you’re lucky enough to find it, diamond can be used to make the rare purple lightsaber. Even your standard armor has been changed. Now you can dress yourself in iron armor and appear to be wearing the classic white armor of the stormtroopers. Or, if you’re feeling particularly loyal to the Emperor, you can wear diamond armor, which will garb you in the red of the Emperor’s Royal Guard. Clone trooper helmet: If you’re feeling that the standard first person appearance of Minecraft is lacking, the texture pack fixes that. The pumpkin block has been changed to a clone trooper helmet (creating a jack o lantern will make the helmet appear lit). If you wear the pumpkin, the HUD will change to a sci-fi like helmet, as if you’re actually playing a clone trooper! So if you’re looking for a texture pack that can redefine your Minecraft experience, the Star Wars texture pack will do just that. From brand new blocks, to lightsabers and a clone trooper helmet, the texture packs adds an entire new level of playability to your game!